Posted on 16, January 2019 by EuropaWire PR Editors | This entry was posted in Electronics & Machinery, Energy, Gas & Oil, France, Infrastructure & Utilities, Technology and tagged Competition, contest, energy efficient, Go Green in the, green, innovative solutions, Olivier Blum, Schneider Electric, Smart City, student, sustainable, Tariro Cynthia Mutsindikwa, Zvirevo Chisadza. Bookmark the permalink. RUEIL-MALMAISON, 16-Jan-2019 — /EuropaWire/ — Schneider Electric, the leader in digital transformation of energy management and automation, launches Go Green in the City 2019, its annual global student contest to find bold ideas and innovative solutions for smarter, more energy-efficient and sustainable cities. In 2019, the competition should attract even more interest, thanks to the four specific topic categories. Students are invited to submit their bold ideas in one of four categories: “Buildings of the Future”, “Plants of the Future”, “Grids of the Future” and “Sustainability and Access to Energy”. 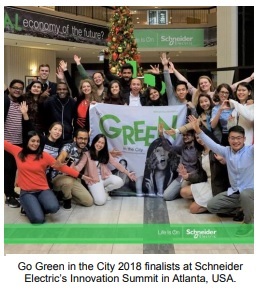 The challenges are connected to Schneider Electric’s sustainability business strategy and reflects the company’s commitment with UN’s Sustainable Development Goals (SDG), inviting students to share ideas to reshape the future and show a more effective side of sustainability: the connection of the social and environmental impacts with technology and the business world.